On a dark and stormy night in Washington, a military base is infiltrated. Leaving two soldiers stunned, the intruder steals a 4-star General's uniform. The theft was performed by The Chameleon, a man with micro molders implanted under his skin; allowing him to take on the appearance of whomever he touches... Meanwhile back at Warfield, the gang are preparing for a field trip to Washington DC. IQ brings along and FM cassette player and pair of headphones rigged up as a homing device, and to overcome Trevor's fear of flying, builds a parachute into the lining of Trevor's long underwear. Tracy is unable to come along as her passport has expired, but Young Bond promises her he would take pictures. Upon arriving in DC, Mr Mitchell, Bond, IQ, Gordo, Trevor and Phoebe bump into Lieutenant Shelly Kaysing of the US Military at the airport, on her way to inform General Duke Armstrong about the theft at the military base. 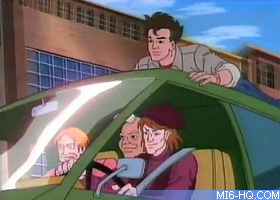 Shelly offers the group a ride into town and, and with the hour she has before she has to meet the General at the Pentagon, gives them a tour of the city. The tour leads them to the George Washington monument, but no sooner does Bond and Shelly get inside the elevator an old woman runs in and closes the door behind IQ, Gordo, Trevor and Phoebe. 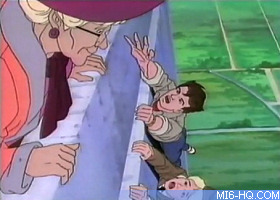 Upon reaching the top of the monument, Bond and Shelly admire the view when suddenly the old woman pushes them both out the window. Luckily the two grab the side of the gigantic monument and hang on for dear life. The old woman was not a woman, nor was she old, it was The Chameleon. 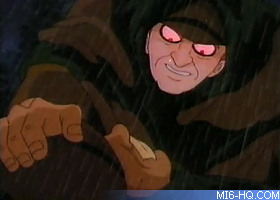 The shape-shifting villain leaves the two to die, but a few minutes later Gordo and the others get to the top of the tower. Gordo grabs Shelly and pulls her to safety, but James falls further down. Holding him by his ankles, Gordo lowers Trevor down to grab Young Bond. But both teenagers are just too heavy for him. At Bond's orders, Gordo lets go and both Bond and Trevor fall from the tower. The two survive using the parachute in Trevor's long underwear. As they float down to safety, Bond spots the Chameleon escaping in a van. They touch down onto the roof of the moving vehicle; although Trevor ends up getting stuck in a tree. Unbeknownst to The Chameleon, Bond rides with them in stealth on the roof of the van. The vehicle eventually stops at a hotel, and Bond follows the Chameleon and his two goons up to room 311. Listening at the key hole Bond witnesses the Chameleon putting on the General's uniform he stole. Bond also overhears the villain discussing his plan: a new high-tech body armour prototype is arriving at the Pentagon, The Robot Armoured Tactical Soldier (R.A.T.S. ), a giant walking/rocket powered assault unit. Complete with ballistic armour and enough firepower to start a small war, any human being wearing it would be rendered almost indestructible. By impersonating General Armstrong, The Chameleon will be able to steal the R.A.T.S. prototype and sell it to the highest bidder - S.C.U.M. - who is willing to pay millions. Dressing up as a waiter and pretending to be room service, Bond enters the Chameleon's hotel room. 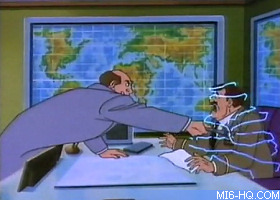 Bond is identified but defeats Chameleon's two guards. The Chameleon makes a run for it but disappears by ducking into room 101. IQ, Shelly and the others arrive having traced the signal from the FM cassette player IQ gave Bond. The six split up in search for The Chameleon, Trevor gets to him first, but freaking out at the sight of the Chameleon's face morphing Trevor hides under the bed of hotel room 101. 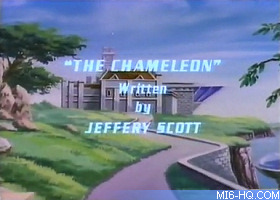 The police have arrived, but The Chameleon uses this to his advantage, as takes on the appearance of Trevor. The Chameleon attacks two police officers with a vase and escapes out of the window. The real Trevor Noseworthy IV is arrested. Trevor is taken to jail, but Bond knows it was The Chameleon who attacked the cops. The only way to get Trevor out of jail would be to bring the police officers' real attacker to justice. Bond and Shelly drive to the Pentagon test hanger to warn General Armstrong about the Chameleon's plot to steal the R.A.T.S. body armour, but they are too late. Fighting from the controls of the R.A.T.S. exo-suit, the Chameleon takes Shelly hostage. 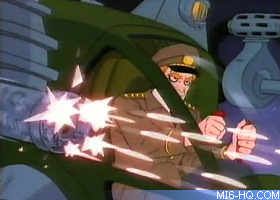 Bond flees but gains control of a tank and fights fire with fire. During the battle, the sprinkler system is blown up bringing a ton of water pouring down on the R.A.T.S. The water causes the micro molders in The Chameleon's body to short circuit, thus electrocuting the villain within. 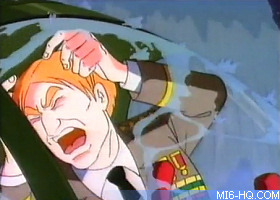 The Chameleon falls from the prototype armour and is crushed beneath it. After Trevor gets out of jail, General Duke Armstrong allows Lieutenant Shelly Kaysing to give the group a VIP tour of the city. This is the first James Bond Jr adventure that does not use any villainous characters from the film series. Having a slim parachute stitched into clothing was actually how the 'Moonraker' pre-title sequence was achieved. A villain changing his facial appearance was used as a plot device in 'Die Another Day'. The R.A.T.S. device looks identical to ED-209 from "Robocop" (1987). The wide shots of Washington DC make the city look like rural farmland. The center of the Pentagon building is filled in, rather than having a central courtyard. The Washington Monument has two small windows on each side at its peak, not one large one. The Chameleon can only change his facial appearance through his embedded 'micro molders', but when he imitates the plastic surgeon, he also gains a matching monocle. Room 101 is seen up a flight of stairs, which in a US hotel, would make it room 201. Indian food does not use American-style hot sauce to spice it up. When Bond intercepts the room service order for room 311, the Chameleon and his goons claim they didn't order anything. 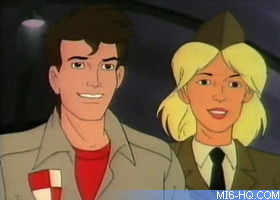 Lieutenant Shelly tells the gang about a top secret government prototype, and the Pentagon guard lets Bond accompany Shelly to the test hangar with no ID. So much for national security. The R.A.T.S. 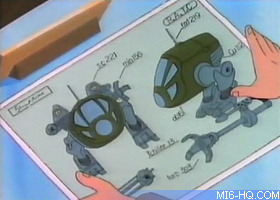 blueprints are labeled R.A.T.C. The R.A.T.S. prototype fires lasers (the cartoon series never shows bullets being fired) but they sound like traditional machine guns. Bond calls the Chameleon by name during the final confrontation, but at no point does Bond learn of his identity. Bond: Please give us a hand! Chameleon: Why of course. (Claps) A wonderful performance, the most touching death-scene I've ever witnessed. Mr Mitchell: Something tells me I don't want to know what you've been up to, James. 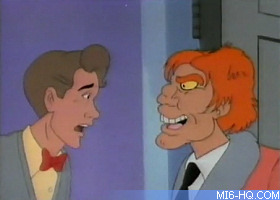 James Bond Jr: I've just been checking out the 'many faces' of Washington DC.